Due to the impact of global warming and increasing cost of fossil fuels day by day, development of alternative sources of energy has become important so that the world’s future energy needs can be mitigated. The focus has been given to develop economically viable and environment friendly technologies. Among all the forms of alternate energy sources, biohydrogen (BioH2) is of significant interest due to its carbon neutral combustion. Use of second-generation (lignocelluloses) and third-generation feedstocks (algae) to produce BioH2 can be a promising and efficient method, which fulfills the future demand of energy. Recently, BioH2 production using extremophiles has gained high attention due to fast production rate without any preprocessing or mild processing of plant biomass. Extremophiles are reported to produce BioH2 and other value-added products even from untreated lignocellulosic biomass. This chapter presents a review and in-depth analyses of extremophilic BioH2 production from lignocellulosic biomass. 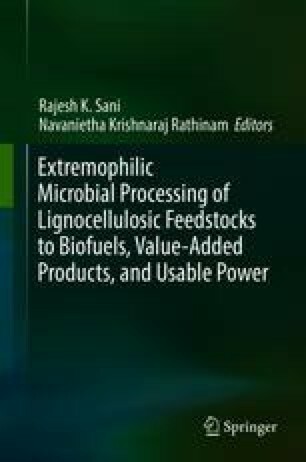 The chapter also provides the knowledge on how to develop a more efficient and economical integrated process for enhanced conversion of lignocellulosic feedstocks to BioH2.